Namie's second best line of the series. And so the final episode of Durarara!! airs. Below the fold, I talk a little bit about the conclusion and the reaction from the ani-blogosphere. With respect to the series as a whole, I enjoyed the ride, and if season two ever does get announced I’ll be standing in line for tickets. I think this might be largely the fault of the final arc, whose placement in the anime implies some sort of grand finale, but whose purpose within the novel series (I suspect) was more to flesh out various side characters. 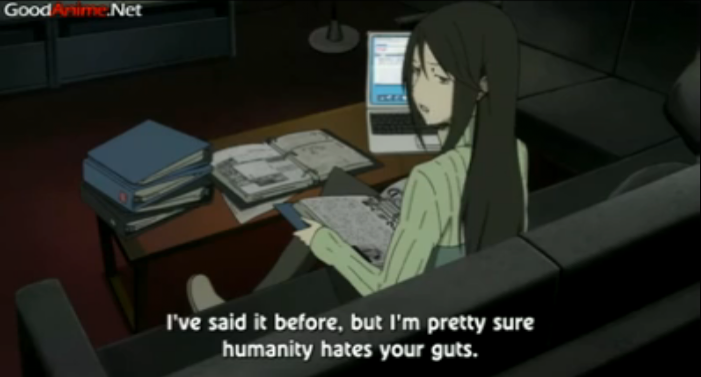 I’ll return to that thought in a moment, but to sum up my feelings, Durarara!! deserves every one of its exclamation points. I’ve rarely seen such a varied collection of fascinating characters, and the show managed to surprise me many times by taking things in very unexpected directions. There is no question that I would watch a second season. Note: what follows is commentary on the season finale and contains spoilers. I thought this was a pretty good ending, albeit, in perfect Durarara!! fashion, not the one I would have imagined. One interesting aspect of the conclusion is that the main characters are not the ones that take out the bad guys. In this final arc there are three “villains”: the Blue Squares generally, their leader, Horada, specifically, and the puppet master, Izaya. At the start of the episode, Masaomi, Mikado, Anri, and Celty are surrounded by the Blue Squares (who have disguised themselves, and taken over the Yellow Scarves). None of them participate in the ensuing battle. Instead Kyohei Kadota leads a commando force of disguised Dollars members, who beat the Blue Squares severely. If you were to pick the most pathetic wretch in Ikebukuro, it would have to be Horada. Ostensibly he is the boss behind the Blue Squares, but he has a rather pathetic history of being beaten by just about everybody in this show. 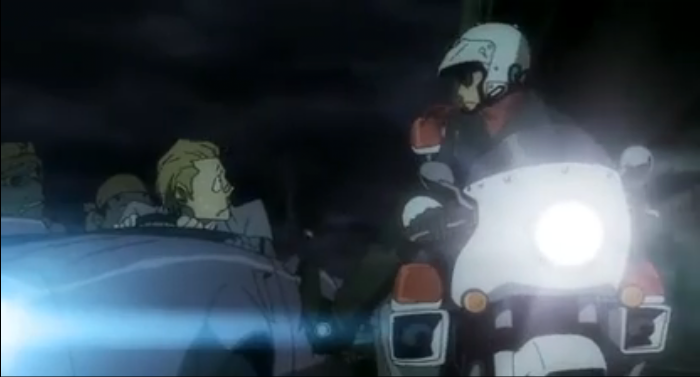 Celty scared the hell out of him a while back. Shizuo punched him out a couple episodes ago. Masaomi decked him several times. Hell, even Ryo managed to dump a bunch of boxes on him. In fact the dude is so pathetic that at one point the puppet master questioned whether he shouldn’t have selected someone more interesting for his role. Now its time for some payback and who ends up taking care of him? The traffic cop we haven’t seen for almost 10 episodes. Of course the true final boss is Izaya Orihara, who has been pulling on everybody’s strings for his own amusement. Anri tries to do something about him, but he slithers out of that situation quite easily. The absolutely most satisfying moment of the episode was Simon putting that huge fist of his to work. I have been a fan of Simon since he dropped out of the sky back in episode three. Unfortunately it wasn’t looking like he would ever get to do anything that cool again. Not only does Simon show Izzy some tough love, he gives him a stern talking to in Russian. As I said, I don’t think the original purpose of this arc was to resolve anything big in the lives of the main characters. Masaomi Kida was a side kick at best until this arc, and now he seems to have been removed from the recurring cast. The way the various bad guys were shopped around to side characters is indicative of the true purpose, to give some of Durarara‘s wonderful side characters a chance to develop. I’m sure a second season would be able to deliver a much more epic story, and I, for one, hope to see it soon. Well even though I think most reviewers came down on second half too hard: Liking off a story that revolves around friends going to war with each other and patience with Anri’s character before she started being cool aside, 20, 21 and 22 were the only truly weak episodes in my mind. But even then, despite being largely based off of solid scenes in the light novel, 20 was handled terribly, 21 and 22 were anime original, but still scenes Narita wanted to put in. Interesting. I’ve heard that Narita also is providing new material for DVD originals. The problem was that their conflict was built up like it was going to cause a huge gang war, but really the conflict was so inconsequential that a handful of cops and 30 random guys cleaned the whole thing up in one night. Drrr! for me is still one of the best out of last years lot. Simply love the characters but with the awesome ease that Brain Base really worked third quarter of the series, they lacked in the last arc. Still I would rate this 9 out of 10 and miss it dearly. About time for that second season announcement! I know. How disappointing is it that we haven’t heard anything yet? Come on! These are some classic characters, they could easily pull out another great season. I know that the last arc is disappointing, but seriously, I’m the only blogger so far who still finds it so spectacular despite that??? Eeeeeehhhhhhhh @_@ But I still have so many praises for it. Whut. Yeah, I don’t know what people are thinking sometimes. Of course there were a lot of people who overall liked the series, and just were disappointed in the last half or third. Still, it seems like a lot of complaining when you think about the other stuff that’s out there. Even though it may have dropped a bit during the second half it was still pretty good, probably one of my favourite shows over the past two seasons. Anri became more than the quiet shy girl and Kida became more than the hyperactive sidekick while giving some of the other characters a chance to shine (as you’ve mentioned). People expecting an explosive finale like in Baccano! were bound to be disappointed though since that had the advantage of all three of the conclusions being so close together, let alone it had a different focus. 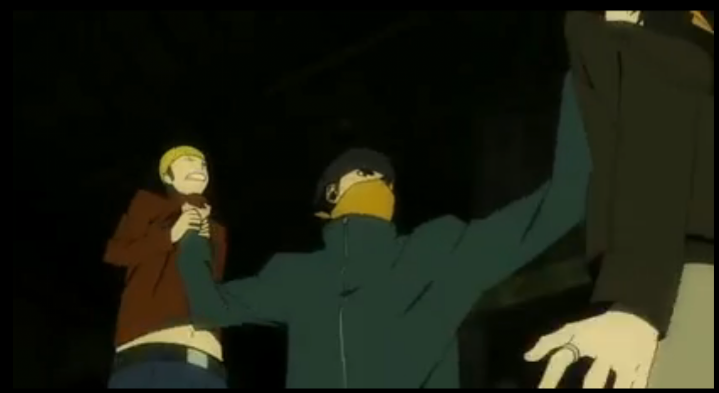 It was also great to see Izaya get what was coming and Simon filled that role well. I was kind of disappointed that Celty’s head remained on Izaya’s shelf. Other than that, I thought the finale was good enough. 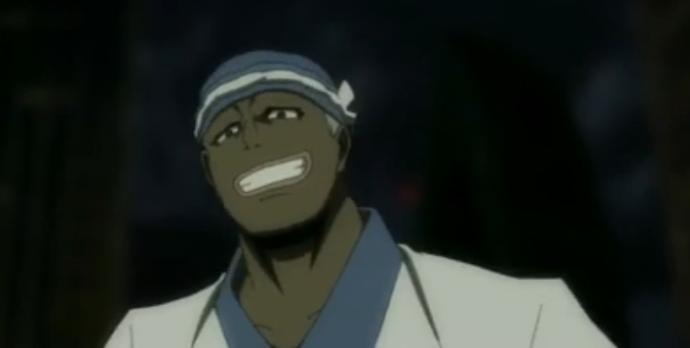 One character I missed toward the end of the series was Shinra’s crazy dad. He provided the single funniest moment in the whole series – when Shinra opens the shower door expecting a wet, naked Celty, only to find his wet, naked father in a gas mask. 😉 It would have been nice to see more of him in the series. Yeah, and this gives me hope that they are going to adapt more of the novels. I WANT SEASON 2. I understand that, but I think that once Celty gets her head back, the franchise is over. I guess in my own way, that makes me as selfish as Shinra. I don’t mind if Celty can’t find her head, if that means I get to keep for a little while longer. Yeah, it did feel very modern. I wonder how well it will hold up. Maybe in just a couple of years all that text messaging will make it seem dated.